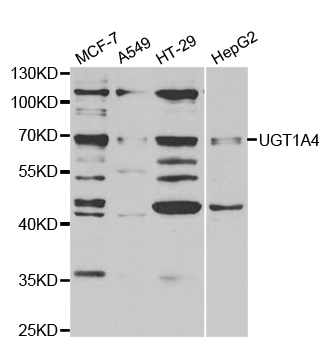 UGT1A4 is an enzyme of the glucuronidation pathway that transforms small lipophilic molecules, such as steroids, bilirubin, hormones, and drugs, into water-soluble, excretable metabolites. This enzyme has some glucuronidase activity towards bilirubin, although is is more active on amines, steroids, and sapogenins.This gene encodes a UDP-glucuronosyltransferase, an enzyme of the glucuronidation pathway that transforms small lipophilic molecules, such as steroids, bilirubin, hormones, and drugs, into water-soluble, excretable metabolites. This gene is part of a complex locus that encodes several UDP-glucuronosyltransferases. The locus includes thirteen unique alternate first exons followed by four common exons. Four of the alternate first exons are considered pseudogenes. Each of the remaining nine 5\' exons may be spliced to the four common exons, resulting in nine proteins with different N-termini and identical C-termini. Each first exon encodes the substrate binding site, and is regulated by its own promoter. This enzyme has some glucuronidase activity towards bilirubin, although is is more active on amines, steroids, and sapogenins. 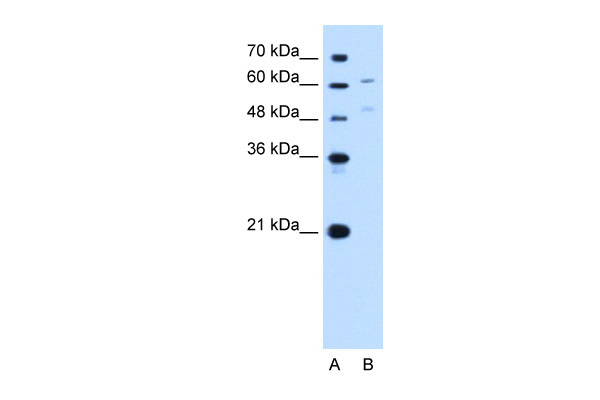 Western blot analysis of extracts of various cell lines, using UGT1A4 antibody.